DVD Synopsis: One of the most successful films in worldwide box office history, Jurassic Park remains a most compelling and spectacular experience. This thrilling adventure features Sam Neill, Laura Dern, Jeff Goldblum and Richard Attenborough. 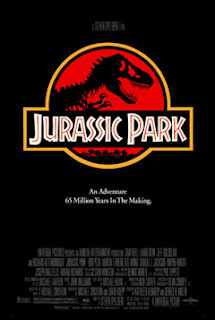 Featuring incredible special effects and action-packed drama, Jurassic Park takes you to a remote island where an amazing theme park with living dinosaurs is about to turn deadly, as five people must battle to survive among the prehistoric predators. There are a number of exhilarating sequences in Jurassic Park, most of which involve dinosaurs that are brought to life by way of some groundbreaking CGI effects. These scenes alone are enough to make Jurassic Park a modern action classic. But the film also manages to stimulate the mind, raising some very interesting questions about the ultimate responsibility of scientific research. As Dr. Malcolm (Jeff Goldblum) points out, dinosaurs had been extinct for 65 million years. Suddenly, and without warning, they’re back, sharing a planet with man for the first time ever. “You were so preoccupied wondering if you could do it”, Dr. Malcolm says to Jurassic Park’s creator, John Hammond (Sir Richard Attenborough), “that you didn’t stop to think if you should”. In Dr. Malcolm’s opinion, Hammond and his organization have tampered with the natural order of things by re-introducing a long-extinct species back into the mix. Exactly what will the ultimate consequences be? It’s a very interesting issue for debate, and I did find the arguments on both sides quite compelling. The truly great thing about Jurassic Park, however, is that, as this moral dilemma is playing itself out, we’re treated to some pretty cool scenes of dinosaurs wreaking havoc on a tropical island. Uh, n-now, eventually you do plan to have... Dinosaurs... On your - on your dinosaur tour, right?